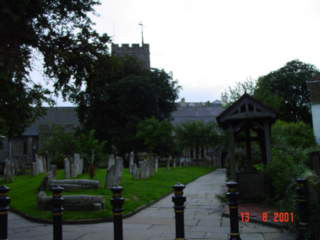 St Eanswythe was an Anglo-Saxon saint who first established the Christian church in Folkestone and whose name is given to the parish church. Born circa 614 Eanswythe was a Saxon princess. Her parents Eadbald King of Kent and Emma daughter of the King of the Franks. Emma was a Christian but Eadbald appears to have had pagan and sometimes Christian beliefs. Eanswythe's grandparents were King Ethelbert of Kent and Queen Bertha who both welcomed St Augustine when he arrived in Kent in 597AD. Circa 630 AD Eadbald built a chapel for Eanswythe in his castle somewhere in The Bayle (street) area east of the present church in Folkestone. This chapel was dedicated to St Peter & St Paul. Here Eanswythe settled with a community of nuns as Abbess and Founder of the First religious Community for women in England. The date of Eanswythe's death is usually given as 640AD. The monastery did not survive her, being either sacked by marauders or victim of coastal erosion or perhaps both. It was later replaced by a Priory which remained until the Dissolution by Henry VIII. Several legends are told about St Eanswythe. Her story is that she chose not to marry and refused a Northumbrian prince as suitor when his pagan prayers failed a test she put to him and could not lengthen a beam required for the building of the church. Her own Christian prayers succeeded Other legends include providing water for her convent by making it flow uphill from the stream a mile away, restoring the sight of the blind, forbidding the birds to meet the nun's corn. Eanswythe's Saint's Day is on 12th September. This is the date when her relics were translated to the new church in 1138. These relics were rediscovered in a small leaden Saxon casket in the north wall of the High Alter Sanctuary in 1885, when work on the present alabaster arcading of the chancel was being undertaken. In 1980 the bones were examined and catalogued by an expert. The conclusion was that they came from one human skeleton, a young female adult aged between 18 & 25 years about 5'4"up inches in height. This is consistent with Eanswythe's life story. Interestingly enough St Eanswythe is not the patron saint of the Folkestone Fishermen. This is Saint Rumwald of Buckingham! 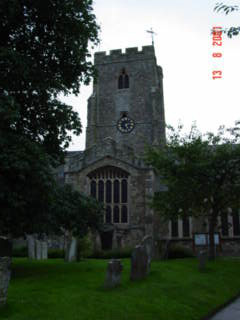 927 A second church with chapel was built by King Aethelstan. The site is not certain. It was destroyed, possibly by Earl Godwin of Kent as part of his running battle with King Edward the Confessor. 1095 Nigel de Muneville and his wife Emma founded a priory for Benedictine monks. 1138 The clifftop on which Nigel de Muneville's priory was built was considered unsafe. A new prior in church would build outside the Castle by William d'Averanches and dedicated to St Mary and St Eanswythe. This is the foundation of the present church. The relics of St Eanswythe were brought to the church. It was destroyed by fire in 1216. 1220 The church was rebuilt exact shape of the church is now difficult to determine. It was almost certainly cruciform, a chancel will with chapels either side, a central tower, transept and a navel with lean-to aisles. 1236 The church was extended eastwards, including the Early English windows at the high altar which are a notable feature of the church. 15th century includes the two chapels either side of the chance will, where in each case the roof was raised, central tower and the font added. 1535 the primary surrendered. The number of monks had always been small and the history of the community in the 15th century in none too glorious. It is said that a stone from the primary buildings provided the stonework for King Henry VIII's Castle at Sandgate. 1705 part of the Nave collapsed in the Great Storm. The building was only patched up because it was felt that the clifftop would become unstable and that like some of it's predecessors would slide into the sea. 1851 Matthew Woodward was made vicar and 47 year of restoration and adornment began in 1859, all in the high church tradition. Not everything remains. . Much of the decoration of the walls deteriorated, including one of the murals, but what does remain makes the church a Victorian showpiece. 1856 The transept was extended and likewise the length of the Nave and north aisle. A gallery was added at the West End. 1869 The Chancel and the present Lady Chapel were added. 1872 The South Aisle of the Nave was added. 1874 A newer West Window was given by doctors in memory of William Harvey (local lad who discovered the circulation of blood) and the addition of a west door and west porch. The churches basically remained unchanged except for additions in 1954 and 1957.